Is there an invisible “Energy Grid” surrounding the planet? A grid which may hold the secret to obtaining power that can be used for good … or evil? Today we know that Tesla was right. Quantum physics has demonstrated that all matter, at its sub-atomic core, is actually energy. This includes both sentient life, inanimate objects and the particles of space. Matter is, in fact, more energy than it is “stuff”. In its (seemingly) solid form, matter also emits energy, as countless studies have shown. And when it comes to matter which emits energy, none may be more important for us to understand than that of an energetic grid. A grid, many argue, which surrounds the Earth. Why is this important? Because if the Earth emits energy along specific lines and cross-point which can be harnessed by humans, those aware of this power are at a distinct advantage over those who remain ignorant. As with many “unsolved mysteries”, the notion of a grid which surrounds the Earth has polarized theorists and experts into two distinct camps: Proponents and Dismissers. While proponents argue that ample evidence exists to prove an energetic grid’s existence, dismissers categorize the theory as another fringe element popular with Conspiracy Theorists. But even if mainstream thinkers dismiss the very existence of a grid, a closer examination indicates there could be much more here than meets the eye. The lines which comprise this grid (in theory or in fact) are often referred to as “Ley Lines,” and when we study them closely, we see that humans throughout recorded history appear to have been well aware of their existence, thanks to the many ancient sites found along them. The term “Ley” itself comes from the Anglo-Saxon, meaning ‘cleared strips of ground’ or ‘meadows’. But these lines we are referring to are primarily energetic, and exist whether the land is stripped of its ground cover or not. 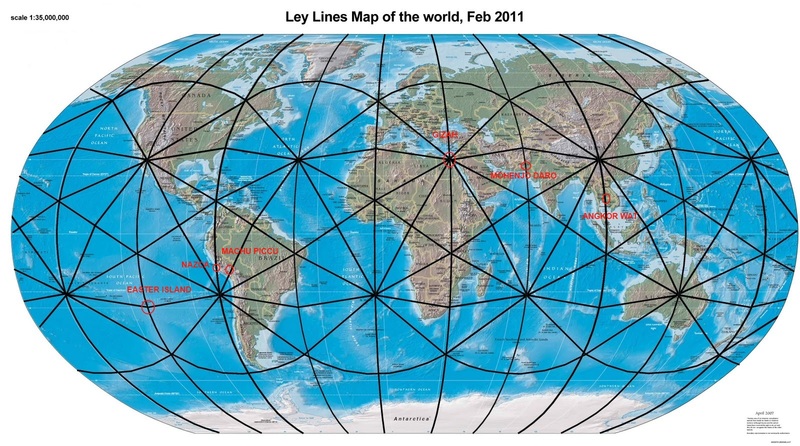 All Ley Lines meet at intersecting points, forming a matrix or grid across the body of the planet. These grid points, according to proponents, are the strongest “power spots” on Earth. Apparently many of our ancestors thought so too, since sacred sites such as henges, mounds, megaliths, pyramids, famous energy vortexes, and even cathedrals are frequently located directly atop these cross-hair power spots. In fact, mapping the grid shows us that many of the world’s most renowned sites sit atop Ley Line meeting points. Machu Picchu, the Pyramids of Giza, Easter Island, Puma Punku, Lhasa Tibet, the ancient ruins of Mohenjo Daro, Findhorn in Scotland, the Bermuda Triangle, the Arizona vortices, Angkor Wat, the Nazca Lines, numerous obelisks, and sacred domed structures around the globe all attest to the very real possibility that something beyond the visible world is involved here. Exactly how our ancestors knew about these lines may forever remain a mystery, but what we can deduce today from our own knowledge, reveals information that can powerfully aid the planet – or deeply harm it – during these all too critical times. Pseudoscience or Solid Platonic Fact? According to mainstream thinking, the study of a planetary grid is considered a “pseudoscience.” However, when we look to the precise mathematics connected with this grid, then refer to the patterns and themes reflected in Sacred Geometry, a meaning beyond materialist scientific thought begins to emerge. Plato acknowledged grids and formulated a theory of the Earth which states that the base structure of the planet evolved geometrically: from the most simple shapes to increasingly complex ones. It’s no surprise that these shapes are today known as the “Platonic Solids” and include the following: the cube, the tetrahedron, the octahedron, the dodecahedron, and the icosahedron. According to Plato’s theory, these energy grids around the Earth evolved through each of the shapes over time, with the more complex superimposed over its predecessor. The result is an all encompassing field which forms the energetic basis of Earth. An energy, according to Plato, which literally holds the Earth together. In 1921, Alfred Watkins, an English pioneer of photography had something he called a “Flood of Ancestral Memory” while looking at a map of the Herefordshire countryside. Watkins noticed that numerous prehistoric places, such as standing stones, earthen burial mounds, prehistoric earthen hills, and other features fell into straight lines which stretched for miles across the country. Watkins spent many years studying these alignments, both on the ground and on maps. He took photographs, wrote books and gave lectures. In response to his work, especially to his most important book, The Old Straight Track (1925), a group of people from across Britain formed what they called the “Straight Track Club”. This group conducted field research throughout Britain, looking for alignments of sites, and remnants of old straight tracks lying along them. It wasn’t until the 1960s that Alfred’s research was furthered and modified by others. One of these was Tony Wedd, a former Royal Air Force Pilot. Wedd believed the Lines served an entirely different function. Namely: the “cross-hairs” of line intersections were used as UFO landing sites. Wedd’s hypothesis inspired other investigations, throughout the 1960s and on a global scale, examining the energy output along Ley Lines. As it turns out, there are several different Ley Line grid maps. The variety can be attributed to different researchers throughout the 20th century. All of them, however, draw their conclusions from the fundamental geometries of the Platonic solids. Bill Becker and Bethe Hagens, for example, have conducted extensive research on Ley Lines. Their review of the code of the Platonic Solids’ Earthly positions was based on the work of Ivan P. Sanderson. Sanderson was the first to argue that the icosahedron form was evident and at work across the planet. Sanderson identified what he called “Vile Vortices” distributed geometrically at 12 key locations across the globe. All of these sites shared similar, mostly negative, qualities. Most famous among them are the Bermuda Triangle and the Devil’s Sea. Becker and Hagens supported, for the most part, the planetary grid map as initially outlined by the Russian team Goncharov, Morozov and Makarov. The Team organized the grid differently than Sanderson, basing it instead on the relationship between the Great Pyramid at Giza, and the north and south axial poles. However, Becker and Hagens believed the Russian version was incomplete. This led them to theorize and map out a new, more complex variation of an Earth grid, based on R. Buckminster Fuller’s icosahedral-based, spherical polyhedron. Even though experts like Dan Shaw, Nassim Haramein, Becker and Hagens, Sanderson and the Russians have all conducted research on Ley Lines, mainstream science does not formally acknowledge their existence or influence. Could this be due to a more hidden agenda? One seeking to keep such knowledge from the public? If you enjoyed this Ancient Explorers article, we invite you to participate in our ongoing exploration of archaeological mysteries, ancient wisdom, and how all this ties into our ancient origins. Enter your email to the right to join our global community. You’ll get free articles and videos from world-renowned historical experts, access to our private forums, and be the first to know about new artifacts and hidden truths unearthed in the field. Even though there are debates still present, the primary anthropomorphic Buddha representations are usually considered as the result of interaction between Greeks and Buddhists.